Though the Clann Eireann name doesn’t appear until the late ’30’s, the tradition of a club in Tannaghmore or North Lurgan goes back much further than that. It was in 1910 that the Dwyers was founded and Clann Eireann is only the latest name change, though it has stuck for 50 years or more now in that same line of Dwyers, O’Neills and Fianna, who used Ferris’ field opposite the old schoolhouse in Tannaghmore as their pitch. 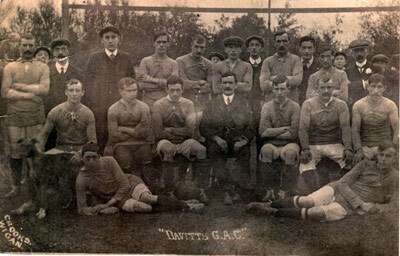 There had been a team, the Davitts, who played for one year in 1909 in Ferris’s Field but they were not a genuine Tannaghmore team and, as they were the fore-runners of the present Clan na Gael Club, we wouldn’t claim them, anyway. So it took 25 years from Cusack founded the G.A.A. till its impact showed in Lurgan area. But, if we did want to go back further than 1910, we could. A man from our area, James Campbell from Milltown, an uncle of a present Clann Eireann member, played in the very first All-Ireland Final in 1886 with Dundalk Young Irelands as Louth Champions. How’s that for a pedigree? The Dwyers was founded by Jack McKavanagh, Bob McCorry, Willie John Leathem, Mickey and Willie Henderson and James Mallon. The same McKavanagh and Henderson names are still very prominent in Clann Eireann. The Dwyers played in 1910 in a field of Frank McKavanagh’s at Milltown and then, a year later, moved to Ferriss’ Field. It’s worth while looking at those two fields now, just to compare them with Clann Eireann’s two Main Grounds and Practice Pitch. The old ones are like cabbage patches. Dwyers played in the South-West Antrim League and had their first success in 1916 when they won the League Championship. They brought James McClements, James Henry Walsh and Ned Heaney on to their committee in 1917 and these three with the two Hendersons guided the Dwyers to a great success in 1924 when they won the Antrim Junior Championship and Gola Cup. The team on that occasion was:- Jim Creaney, Micky Henderson, Frank Cochrane, Felix Devlin, Jack Thompson, Davy Hall, Frank Burns, Joe Henderson, Vincy Fannon, Ned Heaney, Urban Magee and Jimmy Haughey (13 a-side, but one missing). Felix McCann and Joe Creaney joined the Committee later to build up a new team but the Dwyers had little more success and eventually faded out in 1929 or ’30. Though the O’Neills, founded by Tommy McKavanagh, Arthur O’Neill (Jaunty’s brother) and John Murray filled the gap, as Tannaghmore team, for a couple of years, the real successor to the Dwyers was the Fianna.